You know how the old stock trader's saying goes: "Buy the rumor, sell the news." That appears to be happening with RIM's value right now as BlackBerry's price dropped rather sharply during the official BlackBerry 10 announcement. As of this writing, the company's price per share is hovering around the $14.80 mark while it stood at about $16.50 only hours ago. Still, the company is doing way better than it did last September when its share price hit a bottom of $6.31. But since then, optimism and hype around the new BlackBerry 10 platform and smartphones managed to lift it up considerably – near an $18 peak, which it hit a week ago. 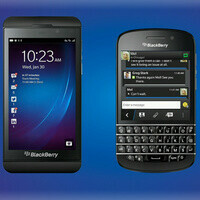 How will BlackBerry stock move over the coming days and months? Well, that depends on how well those BlackBerry 10 smartphones – the BlackBerry Z10 and BlackBerry Q10 will sell once they hit the market. Both of them sure seem promising, but ultimately, sales figures and investor optimism is what will shape the direction of the company's market value. do you think investors took a look at the specs of the device and realized it's not as good as what's coming out this year so they got scared off a little? i hope bb10 can keep it's market share and grow, we need more options not less. I do not think so. The average consumer responds to the device and promotion, not the specs, and the average investor responds to the forecast, not the tech. BB will sell and recover their stocks, or not sell and drop like a rock. I think today's announcement was not as amazing as some investors were hoping. Stock market shares are a knee jerk reaction, unless you look over the long term (18 month or so). No. The investors dumped the stock when they found out there was no specific on-sale date for the entire universe of U.S. carriers. Not earlier than mid-March is NOT a specific on-sale date. No earlier than mid-March of 2014.... RIM (BB), finish your sentence. I couldn't disagree more. The brand that had value was "BlackBerry" not Research in Motion. The reason for the drop was more likely an adjustment for "reality" vs hype and for delayed cash flow estimates pushed out to March for the U.S. launch. Agreed, on all your points. It's not Blackberrys fault that the phones won't be released till March. If you blame them you have no clue and shouldn't be on this site. Everyone knows about the bloat ware and the famous carrier stamps. Look at the S3 it had to be held back 2 months so it could be brand for each carrier. Look at what Verizon did with the note 2. Why the hell would you want the logo right on the home button. The US carriers will kill BB here in the US. Your comment shows that you are lacking fundamental understanding about how investors value a stock. It is all about earnings to investors. No sales means no revenues, which means earnings will take a hit. The volume investors don't give a flying f*ck about bloatware or carrier branding. You obviously didn't understand my comment. I wasn't talking about investors I was refereeing to people who want to comment and say these phones have last years specs. For blackberry those are the right specs this year. After Blackberry 10 has been delayed for what has now turned into years, the term "so close yet so far away" comes to mind. They should have secured a specific date from the carriers. On a completely unrelated note, any word from that Motorola rep of yours, Sniggly? The delay make their stock drop. Looking at it from purely a percentage value, their stock has dropped much less than Apple's have. As Apple and Blackberry compete within the exact same industry, their respective stock prices are entirely related. Seeing as this article is about Blackberry's stock price, a comment about Apple's is understandable. Whether his original comment has any actual merit, on the other hand, is debatable, considering that Apple is still worth around 61 times more than Blackberry, and that Blackberry's stock is down 90% from its all-time high in June of 2008, while Apple's is "only" down 34% from its all-time high in September of 2012. From this perspective, I think I'd still much rather be in Apple's shoes right now. oh what do you know... just like nokia's announcement of lumia 920... oh well success will still be achieve!